ETRI researchers developed technology capable of sending packets of digital information at 25 Gb/s (giga-bit per second) - 10 times faster than currently available speeds. Researchers in South Korea have developed extremely fast information processing technologies that can help usher in the next generation of the Internet. Daejeon, Korea, Jan 17, 2019 - (ACN Newswire) - Researchers at the Electronics and Telecommunications Research Institute (ETRI) in South Korea have developed technology capable of sending packets of digital information at 25 Gb/s (giga-bit per second) - 10 times faster than currently available speeds. The technology, named TIC-TOC, is a critical component of the future Tactile Internet, in which information is sent and received at speeds on par with human perception. The technology operates at a speed fast enough to download a 3 GB movie within one second. Furthermore, the TIC-TOC system enables more urgent data to jump ahead of other information packets and be transferred in one milli-second (1/1000 of a second), the same speed at which the human sense of touch works. TIC-TOC stands for "Time Controlled Tactile Optical Access" and is designed to work on 5G networks. The researchers anticipate the TIC-TOC technology will help advance virtual reality and augmented reality in all sorts of sectors, from education and healthcare, to entertainment and public safety. For example, it could be possible to deploy and operate robots in dangerous or disaster areas with instant sight and feel communication between human controllers and machines. When the machine sees something, the humans sees it, and when the human remotely controls the robot's hand or head, the motion will happen immediately. The same could be true for telesurgery, with a doctor remotely controlling a robot performing the surgery, but the doctor feels as if she were in the operating room because the response is instantaneous. "The Tactile Internet is expected to be the fourth industrial revolution," said HwanSeok Chung, a project leader at ETRI. "We will see robots, cars and all other machines connected to the Internet all around us. Tactile Internet will enable humans and machines to interact with each other even from far away." The team developed TIC-TOC in order to help address the traffic jams that occurs within current information processing systems, causing delays. By increasing the speed at which information can be transmitted, and allowing more important information to jump the queue, they have ensured that as soon as a user clicks on a webpage, it loads instantly, or they can watch a video live essentially without any delay. Described in the Journal of Lightwave Technology, the TIC-TOC technology consists of internet access control chips and optical transceivers to speed up data processing time. 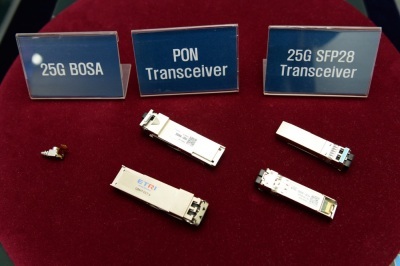 The optical transceiver converts high-speed electrical data into optical signals to transmit over optical fibers. The chips guarantee latency (the time from data's origin to destination) is less than 1 milli-second with ETRI's new low latency oriented packet scheduling technology controlling network traffic. The chips could further increase network speeds faster than 25 Gb/s by combining several channels for data transmission. A few hurdles remain before commercialization such as system implementation. ETRI continues researching to solve such hurdles, and the tactile Internet enabled by TIC-TOC should be available in one year.